As you enter CounterPulse, projected words are scattered across the side and back walls of the performance space. “Water pipe” reads one under the pipe that runs just below the ceiling. “Dag” reads another, above the head of performer Dag Andersson, seated in a fold up chair upstage, deeply engaged in a conversation with his smart phone. Names of the artists involved in the piece (“Dag”, “Sheldon”…) as well as the objects that make up the space (“concrete block”, “rear”, “side”…) intermingle undifferentiated across the walls, suggesting their innate interconnectedness. Seemingly self evident, this relationship -between artist and venue- has been seriously compromised in the San Francisco art scene, where many artist-run spaces have been shut down due to the sudden frenzy of the real estate market, most notably fueled by the recent tech boom. While unquestionably responsible for this situation, technology also provides new creative possibilities to artists, as Curtis is prompt to demonstrate. During the first section of his piece – “Saying What I’m Doing”- he transforms the current phenomenon of social media into a generator of performance material. “I am beginning,” he announces, as he stands on the floor. “I am standing,” he continues, signaling what is happening both externally and internally as he stands and moves around the room. Soon after, performer Abby Crain and Curtis exchange short imperative sentences, reminiscent of text messages, that act as choreographing prompts: “Slouch” proclaims Crain to Curtis, who executes his partner’s order. “Sit up” he responds, and Crain straightens her spine. And so their duet continues, moderated by their vocal cues to each other. The ambivalent relationship between art and technology that Curtis’ piece tackles is most poignantly exposed during intermission, or what Curtis calls “Inner Mission.” The choreographer departs from both stage and the theater itself, for a bike tour around the Mission district. Technology allows Curtis to be here and there at the same time, interacting with the viewer from afar while biking through the rainy streets of the San Francisco night with a video camera attached to his body. 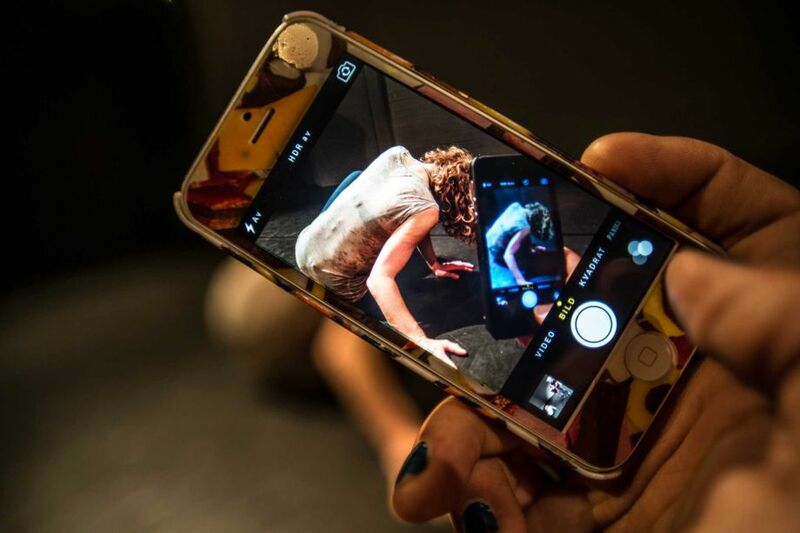 Technology allows the artist to expand time and space, the two cornerstones of dance and art performance. Although with an ironic twist, technology is used here to locate former body-based arts organizations that have been forced to close because of the changing economics, such as 285 9th Street, home of the Climate Theater for 25 years before its closure in 2010, or 1519 Mission, a performance space started in 1978 by Jon Sims, which closed in 2010. Not only comprised of inanimate parts, these spaces hold memory, build community and sustain the creative process, Curtis reminds us. When stopping his bike in front of the door of these former arts organizations, Curtis gives us a short history of the place, remembering seeing a show here or taking a class there. Back at CounterPulse, while “saying what [he] is doing,” he shares excerpts of his own history as a viewer, recalling past performances, which have incontestably influenced his trajectory and work. “Remembering a piece I saw in 1991, Steve Paxton’s improvisation on Goldberg Variations,” Curtis calls out, as he moves his arms and hips, attempting to “create the feeling in my body reminding me of that piece.” But quickly that memory leads to “remembering a reiteration of the piece I saw in Berlin in 1994,” he continues. The memories of these artists who have come before and influenced him are attached to a place and a moment in time, reaffirming that artists performing in venues are key to the reproduction and continuation of the creative cycle. The piece poetically exposes the vulnerability of artists in a city that is prompt to push them out. There is certainly vulnerability in Crain’s risky balance on Curtis shoulders. She stands tall, letting his hands go, while he walks on his toes forward. She challenges him to add a sway to his hips, rendering the balance even more precarious. Vulnerability also, when Crain and Anderson engage in a riveting series of jump flips, their bodies knit in a tight circle, slipping and falling at times. Vulnerability again, when Curtis stands naked during the last section of the piece, next to performer Rachael Dichter, dressed in tight pants, heels and a fur jacket, open enough to disclose a black brassiere. The projected name tags at the beginning of the piece somehow bring to mind the yellow post-it stickers filled with foreign names, scribbled in handwriting, that people learning a new language might stick all around the house. These colorful flags indicated a whole linguistic world to conquer, and contained a hint of studiousness, exoticism and possibilities. In The Dance That Documents Itself, the projections do not point to a new and exciting world to discover, but instead one to save, with artists in mind. A world that understands that, in order to both preserve and enhance the vitality of culture, artists need access to affordable space to continue to practice, explore and shatter the boundaries of their field. How can we expect to navigate this “newly unpleasant world”? 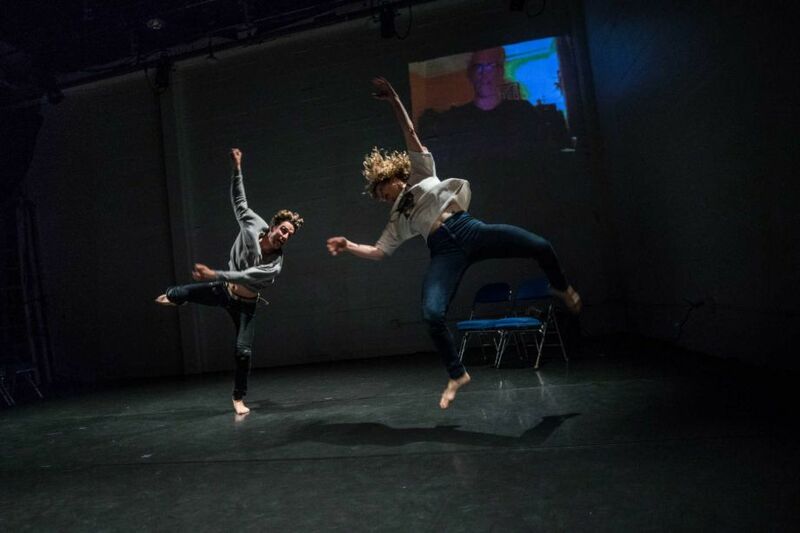 In one sequence of KT Nelson’s last piece Dead Reckoning, dancers storm across the stage, looking up to the sky as if searching for an answer to their disorientation and the loss of their hold on their surroundings. The ominous feeling their movements convey is heightened by the menacing undertone of the violins playing in composer Joan Jeanrenaud’s score. At one point the audio is torn apart by the screeching sound of trees falling and the shattering of bark echoing throughout the room. Touching upon the exploitative relationship between humans and their natural environment, Dead Reckoning is a piece for 10 dancers which stemmed out of Nelson’s sabbatical in Death Valley in the late fall of 2013. A work-in-process version of the piece was presented last month during ODC Unplugged. Dead Reckoning will premiere in March 2015 at Yerba Buena Center for the Arts. Nelson and I sat down last week to talk about the piece. Marie Tollon: During Unplugged, you mentioned that one of the stronger images that arose from your time in Death Valley was the magnitude of the landscape. KT Nelson: in Death Valley, you really experience the magnitude of the towering mountain ranges against the below sea level valley. Because there is minimal or almost often no plant life, the rock formations are unsparingly exposed. You get a glimpse of what forces went into creating these formations. There you are, below sea level, at the bottom of this valley and you just see magnitude. Literally, people are like these little ants walking around. This was the spirit in which the piece was made. MT: Can you talk more about the title of the piece? KN: I first read about this term from naturalist Kathleen Moore, a philosophy teacher at Oregon State. She had a chapter called Dead Reckoning, [where she recounted] sailing with her daughter in cloud cover. She began experiencing anxiety about their situation. Apparently “dead reckoning” is a term when you navigate without the stars. Stars are highly predictable and dependable reference points. Without them you use intuition and less dependable reference points. When you do this, your navigation is subject to accumulative error. I applied this concept to the implications of navigating climate change. Personally I felt that this was Kathleen Moore’s intention in her book Holdfast: At Home in the Natural World. Her dead reckoning story is second to the last of several essays. The rate of change in climate change offers us unfamiliar and perhaps unrecognizable reference points. MT: For me, there is an element of bareness in the piece that comes through the movements but also from how you describe the costumes and set. The work of Georgia O’Keeffe, who lived in the desert and whose work had that essence, came to mind. KN: One of the things that I want in the very beginning of the piece is just energy, I am not sure you need to see anything. The opening of the piece is relentless energy. It is my attempt at possibly imaging what went into creating the Death Valley -even though I am using human dancing bodies, I don’t need you to see the movement but rather feel the energy. Until you see [ODC company member] Jeremy’s solo, a lone figure in a contained space. That is when I want you to notice a person. His solo represents how tiny an individual is in comparison to nature. After Jeremy’s solo, the rest of the piece is built on a series of images about our relationship to nature. There is a section about diversification, with two women and two men. In this section I also look at sexuality without romance or eroticism…. I am simply looking at our shared characteristic with the natural world. MT: In the closing section of the piece, we see two dancers walking casually on another dancer. KT: Yes, as we carry on with our lives, we often walk on and over something, indifferently, without noticing what we have done. It’s not dramatic but it is real. It is done without knowing. This lack of awareness although relatively mundane in the long run may be deadly. As I said during the Unplugged, I’m not mad at people, but I’m perplexed by the fact that we continue to be so unaware. This is a question I have: Why do we remain so unaware, even though we know better? The section after the male and female duets is about youthfulness, how we all go into nature and play around in it, and yet incrementally destroy it, whether it’s ski lifts, ropes and spikes left in rocks or bike trails. We love it, but we are affecting it deeply and unconsciously. My message is really in the two ends of the piece. And the middle is a journey in the ways we are just like nature and how we engage with each other and with nature. MT: In an earlier conversation, you mentioned the work of your mother who was an environmental activist. KN: My mother was so upset at how we treated the natural world. In the 1970s, she said: “It’s going to be gone!” She is the main grass root person who fought for the National Park and Seashore recreation area in Santa Monica Mountains, in Los Angeles. Her values are deeply embedded in me. MT: At several moments, one of the dancers willfully puts his hands of a fellow dancer’s head and turns it in another direction, to face the audience or forward. Is it a hint that for you, the purpose of art is to shift the focus back to what humanity should really be looking at? KN: Yes, in the beginning, Dennis is the one who dances while [the other dancers] are watching him. He is the one that is beginning to notice. That’s the beginning of awareness. MT: A paper prop, which represents snow, plays an important role in the piece. KN: There is joy when we engage in nature. But how far we take it is fairly unthoughtful, because at the rate we play in it now, we will change the quality of what it is. What we know now will most likely not exist in the future. Nature will never stop being, but the relationship we have had with it is going to change because we are changing it. We have been brought up in convenience so thoroughly that we really have no sense of how convenient it is. I don’t heat my house. I have a compost toilet, storm water, grey water and solar energy serving my home. I’m trying to live the walk, because if I can find pleasure in it, then there is a way through this. If there can be artistry, pleasure and depth in living differently in a way that is not so harmful, then I think we have a chance. MT: Is it your first collaboration with composer Joan Jeanrenaud? KN: Yes. I have used her music when I have done some guest choreography, so I know her music well. [Joan and I] would meet once a week and spend a few hours together. I knew which music of hers I really love. So I told her: “I love the fragileness of this, or I love the pulse of this.” She would pull some things, off the computer, and asked me what I liked about those, so we just deconstructed and broke things down. I sent her some of the photographs of my trip, I talked to her about my opening and closing images, so she built the sounds for those two [scenes] since they were very clear. That’s how we proceeded. And then she came to rehearsal and said “Ok, now I get it.” She then went back to the studio to build on it some more. MT: During Unplugged, you shared some of the tasks you gave to the dancers to generate material. For example, you had one dancer shoot a paper plane and another one video record the trajectory of the plane. The dancers then studied the plane’s journey and used it to create material. KN: I used the concept of “implications” to develop problems for the dancers to generate movement. In our first exercise, I asked the dancers to close their eyes, and listen to the sounds around the room. They worked in pairs. One would listen and the other would record the one listening. As the one dancer listened, they were to move in response to the volume and quality of the sound they heard. After watching the video of their movement responses to sound they collected the movement that was interesting to them and made a solo phrase. My interest in “implication” is that we rarely recognize the implications of things. The impact, the response, the reaction to our actions were the material that I was interested in, even though I don’t show the cause and effect. This [exploration] of hearing came from meditating in the desert, how much sounds there actually was. The idea of the airplane exercise came from standing on this huge dune. You are 12 stories up. It looks so soft, you could just tumble and fall, and be fine. So we followed the plane’s path and in the piece, the dancers who are falling are being caught, because when standing on that dune it felt that nature will catch you.